Studio Dental Arts is expert at placing crowns. A crown covers an entire tooth surface, restoring both tooth shape and size. It protects and strengthens tooth structure, as well. The most popular type of crown is made from porcelain, which closely resembles your natural tooth shade. 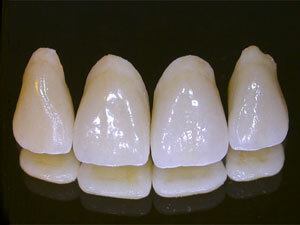 Highly durable and long lasting, porcelain crowns match a patient’s tooth shape, size, and color. Crowns are used primarily to repair broken, decayed, or fractured teeth and fillings. If a root canal has occurred, crowns are often employed. When the temporary crown is removed, we clean the tooth and carefully attach the new crown, making certain your bite and spacing are a perfect fit. To place a crown, we take accurate impressions, then use the mold as a temporary crown for an approximate two week period while the new crown is produced in a laboratory.